Uber Technologies grew to a $60 billion market value by disregarding just about every law, regulation and entrenched special interest standing in its way. But the car service is finally up against a wealthy special interest it probably can’t get around: The class-action bar. Late last month Uber tentatively agreed to pay as much as $100 million to settle lawsuits covering drivers in California and Massachusetts that were filed by Boston attorney Shannon Liss-Riordan. Yesterday Uber was hit with another lawsuit in Illinois, this one intended to cover the rest of the country. Think of Uber as a company in play: Having offered $100 million to make one lawyer go away, it opened the floodgates for similar claims. Another case in Florida also purports to represent drivers nationwide and there surely will be more. The Illinois case was filed by Milwaukee attorney Brian Mahany, who boasts he got a piece of the largest whistleblower settlement in history, $16.6 billion Bank of America paid to settle fraud claims that generated $170 million in bounties. 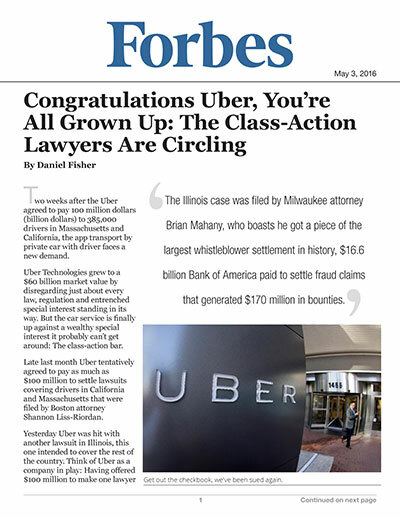 It’s a little different from Liss-Riordan’s case because it is a collective action filed under the Fair Labor Standards Act and requires drivers to opt in, meaning Mahany will have to recruit a critical mass of drivers who believe they are being ripped off by Uber in order to produce enough leverage for a any big settlement. But that may not be so difficult, Reibstein told me, even though Uber maintains 90% of its drivers don’t want to be employees. There’s little chance any of the lawyers will win what they purportedly seek, a change in driver classification from independent contractor to employee. That’s lucky for the many Uber drivers who hate the idea of punching a clock, and reflects the fact federal judges rarely order such a change going forward, Reibstein told me. The most judges typically do is rule that workers were misclassified in the past and award damages for lost overtime wages, vehicle expenses and the like. In the latest case, Mahany’s client, Lorri Trosper, says she is a former Uber driver who worked more than 40 hours a week and “earned gratuities, which Defendants stole from her.” Uber has an official no-tipping policy, but Mahany and Liss-Riordan maintain customers think they are providing tips to drivers, and thus drivers are entitled to the money customers think they are giving them. (Under the proposed California settlement drivers there will be free to ask for tips.) The lawsuit also seeks back wages and, of course, attorney’s fees. Mahany said Trosper stopped driving for Uber after an accident that left her injured and, thanks to her independent contractor service, without worker’s compensation insurance coverage. He told me he sued after the California case failed to settle all the outstanding issues between Uber and its drivers. All of the pending cases require a judge’s approval for any settlement. That may be more difficult than in the typical class action since Uber is new, flashy and different. A federal judge last month rejected Liss-Riordan’s first attempt to settle driver litigation against Lyft, for example, saying the $12 million pact cheated drivers out of what they could potentially win in court. The proposed Uber settlement, which is limited to California and Massachusetts drivers because it was brought under those states’ labor and consumer-protection laws, does not exclude the possibility of future suits over similar issues. That may not matter because even at $100 million a pop, driver settlements aren’t going to make much of a dent in Uber’s market value. Meanwhile the company is building a global customer base for the next iteration: Driverless cars that no lawyer can claim to represent.